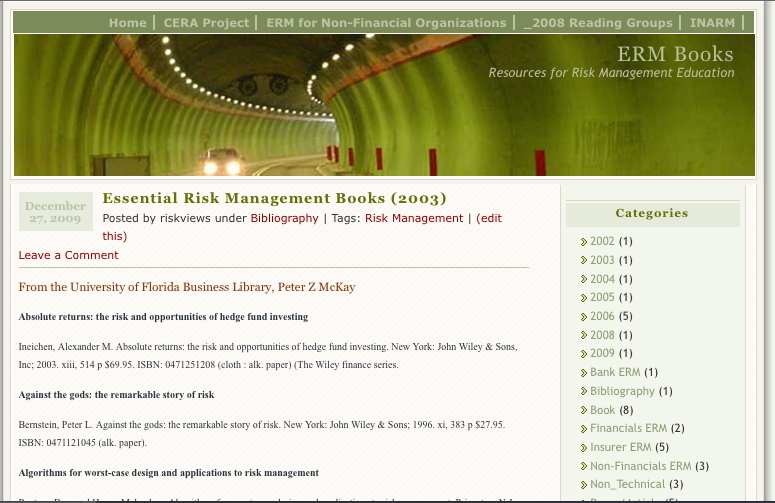 Information on Books recommended by the IAA Global ERM Credential Task Force and other resources and lists of Risk Management books from various sources. Discussions and commentary on risk management books and information about new risk management books are encouraged. As of February 2010, there are about 20 books and articles categorized here and lists posted that identify about 200 additional resources. Help is needed to categorize additional books and articles. Contact Dave Ingram if you are able to help with categorizing one or many books or articles about different risk management topics.